Green Star Movement is one of CSM Chicago’s newest ministry partners. They are a non-profit in the city that inspires students and community members through public art. They use a method called bricolage to create murals in public spaces throughout the city. 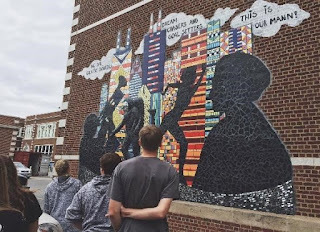 Recently Green Star movement was featured on NBC for the work they are doing; beautifying public spaces, especially on the city’s south and west sides. Not only do they create art for people to enjoy, but they also train students and community members in this particular art form. Green Star Movement was founded in 2005, and since then they have trained thousands of students in mural arts and have completed over sixty murals in public spaces such as schools, community centers, parks, and overpasses. This summer, Green Star has been working on a mural under an overpass in the neighborhood of Woodlawn. Many of our groups and members of our staff got the opportunity to help with this particular project. Those that participated in the creation of this piece were humbled and amazed by the positive response of the community to the project. As the mural was being created, many passing would stop and thank the staff and volunteers for the work they were doing for the community. Often people driving by would stop to express their thanks or ask questions about the project. Regularly those same people would return to the project site later to volunteer their own time to help. It would be easy to dismiss the work of Green Star Movement as simply a cool organization that is making some of the more run down parts of our city look prettier. But the impact is so much deeper than that! The projects done by Green Star Movement become catalysts for positive change in communities. Having beautiful art in public spaces helps reignite a sense of pride and hope in a community, which can then lead to other positive changes in a neighborhood as members strive to continue the work begun by Green Star Movement. Since the work on the project is done by volunteers, community members, and students, the projects become opportunities for people in the community to come together behind something positive. Lastly, it gives community members a space to be artistic and express themselves. This is especially important since often in poorer communities there are few opportunities for artistic expression, as funding for art classes is consistently cut in favor of other things. Green Star Movement is making a powerful impact in some of the most downtrodden communities in our city. We here at CSM Chicago are excited that through our partnership with them we get to have a small part in the incredible work that is being done through this organization. 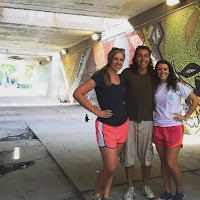 Want to serve in Chicago? Learn how to sign up.